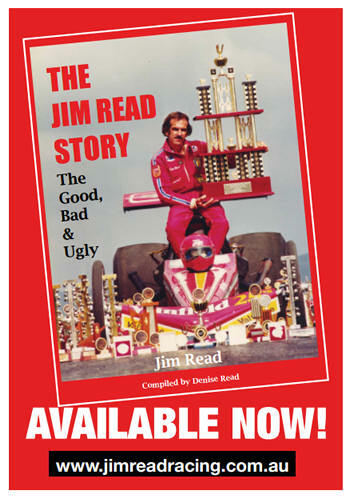 The commentator shouts, “Jim Read is in trouble, it’s an horrific crash he is upside down and on fire and has taken out a concrete pole, the fire truck and ambulance are rushing to him”. Catapulting upside down at over 250mph and thinking to myself, this is going to hurt. My instincts take over as I take my hands off the steering wheel and brace for a big impact. In what seems like hours but must be only a few minutes and in total darkness I assume is death, I consider my life. Visions of my family come racing to me, my children, my friends, places I have seen and the things I have done. Visions of a future I wanted for them, for myself and for the sport I love, drag racing. find out how to purchase your copy here! 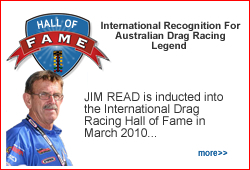 Jim Read Racing to compete at the Santo’s Cranes Super 3 Extreme Drag Race April 2014 at Willowbank Raceway in Queensland. Thanks to the continued support of our Team’s long supporting sponsors and associates, Phil Read will make a welcome return to the Top Fuel ranks on April 18 & 19 at the Santo’s Cranes Super 3 Drag race. “Our last race was the Winternationals in June 2013 and I cannot wait to get back behind the wheel of our three time championship winning dragster” said an excited Phil Read. “I would like to say a big thank you to our sponsors and our fans that have stood by our team and I would also like to thank Top Fuel Australia whose initiatives have also contributed to us being able to resume racing again”. “Our race car has been ready since last year but due to the lack of corporate support we have had to scale back our racing programme” said Crew Chief Bruce Read. “It will be great to get back out there and mix with the other Top Fuel teams”. Team Owner Jim Read said “I’m excited and pleased for my sons and my team to be able to compete at an event held in the memory of Louie Rapisarda”. 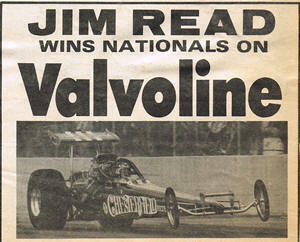 Jim Read captured the 1976 Nations Top Fuel and Funny Car crowns in record times at Adelaide International Raceway. Read's double coupe was the first in Australian racing history and makes him the single most significant racer in the country today.